Fabarnak has received a good amount of buzz over the past year, for both its food and its employment model. The restaurant, located within the 519 Church Street Community Centre, employs people from the community who are facing barriers to employment (i.e. new immigrants, youth undergoing gender transitions, youth recovering from addiction). 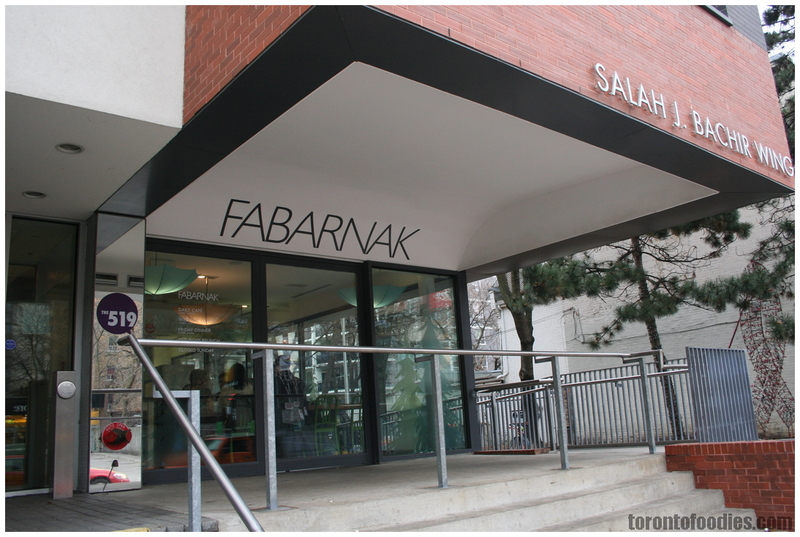 Fabarnak also supports local produce, with 60% of their ingredients sourced from local farms. One of the more popular items is Fabarnak’s “Square Peg”, a bento box for $10, featuring four compartments of random yet creative dishes. Other reviewers have raved about pork bellies, rabbit liver ragouts, and chocolate parfaits in their Square Peg meals. There are only 20 Square Peg meals available daily, so they are rather hard to get your hands on. 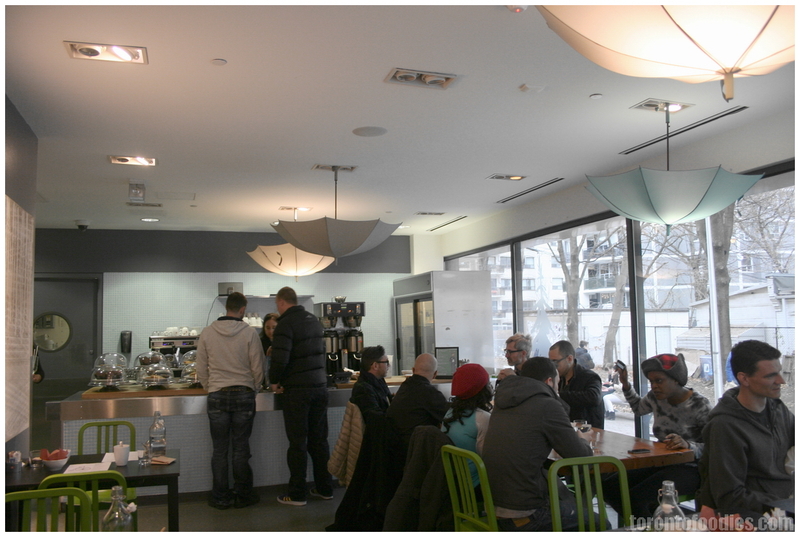 The restaurant has about 5-6 tables, and was fully occupied the entire time we were there for Saturday brunch. I loved the amount of natural light from the full-length windows, but felt frequent chilly breezes from the adjoining community center, through Fabarnak’s doorless entrance. The umbrellas acting as light diffusers are a whimsical (and affordable) touch, and it looks like they change up the colours every so often. Brunches start with a complimentary basket of baked minis, with miniature chocolate scones, apple muffins, and cheese scones. 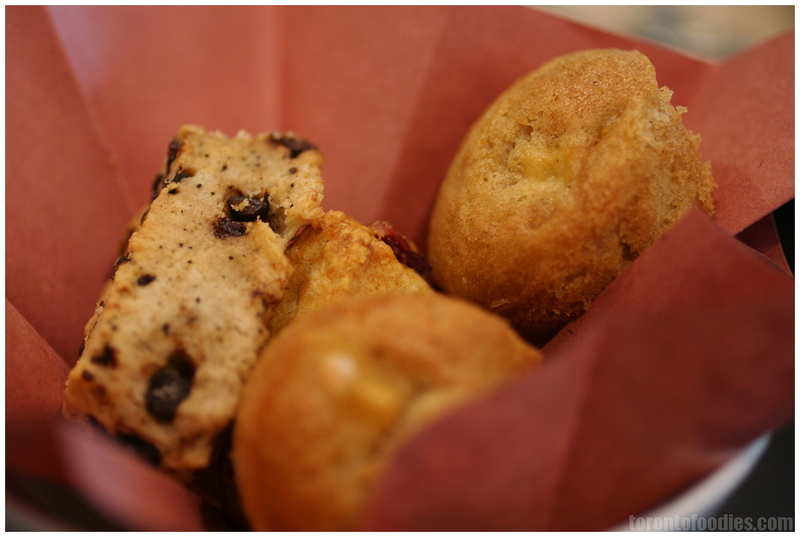 The chocolate scone tastes a bit floury, but the apple muffin had decent chunks of apple inside. 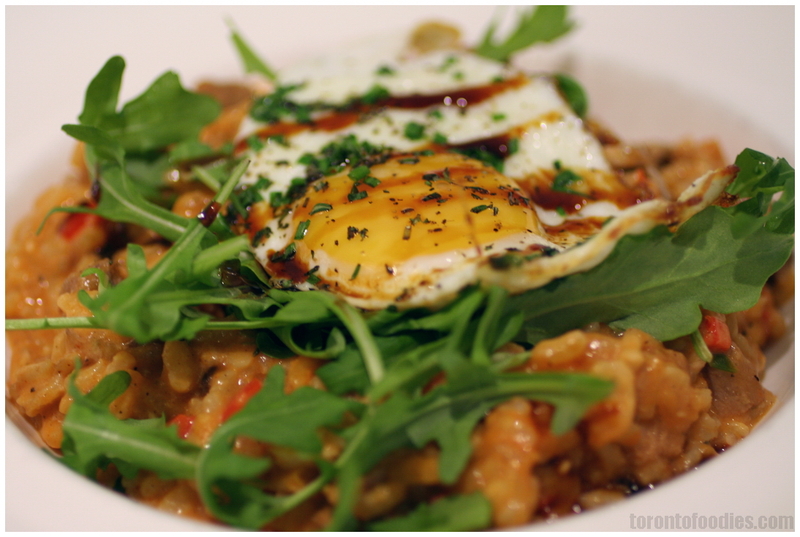 I had the Southern Pilau ($10) ~ American risotto, crab, smoked pork, tomato sauce, smoked cheddar, fried egg. I’m not quite sure what they were going for in this dish. I found the dish to be more sweet than savoury, almost like a ketchup fried rice. The chunks of smoked pork were amazingly tender and near melted in my mouth. The smokiness, however, was very much covered by the overwhelming sweetness. The moisture and creaminess was closer to a wet jambalaya than a risotto. I don’t recall tasting any crab or cheddar in the dish, unfortunately. Don’t think I would order this again. I had a bite of my friend’s Duck Carbonara ($12) ~ bacon, fresh pasta, duck egg, pecorino. Not having looked the menu, I could discern that it was fresh-made pasta from its firmness. There was a nice smokiness to the sauce, almost reminding me of a tea-smoke. 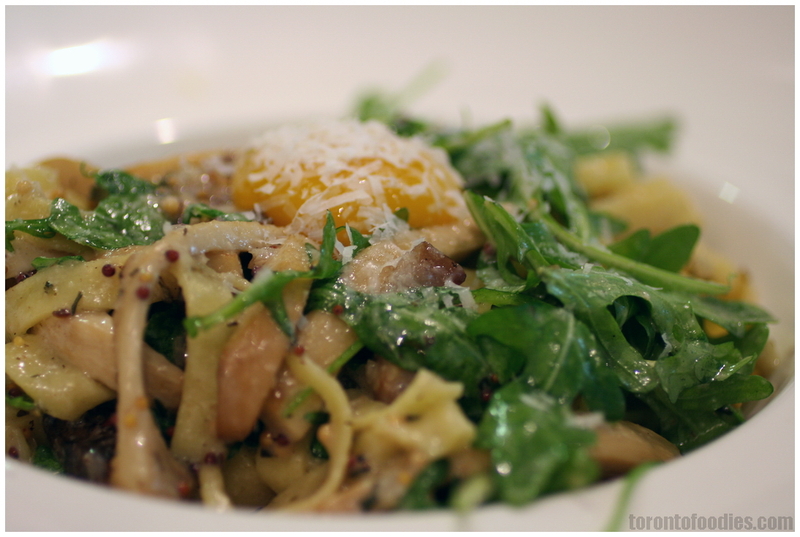 Mild mustard seeds were scattered in the sauce, with the duck egg resting on top for patrons to mix into their pasta. There were geneous pieces of mushroom (they had the crunchy-soft texture of oyster mushrooms), but I can’t speak to the abundance of duck pieces or duck flavour. I would definitely order this again, if not for the many other items on the menu that I’d like to try. 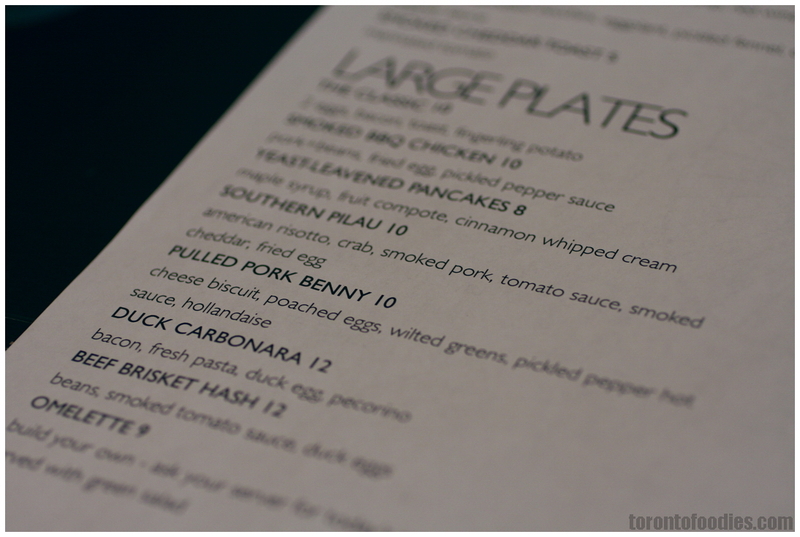 Speaking of other menu items — pulled pork benny, beef brisket hash, bbq beef brisket sandwich, and even the classic breakfast looked fantastic coming out of the kitchen. I would definitely return to Fabarnak, they’re doing so many great things with this place — helping local youth, supporting local produce, and making very interesting dishes at a fantastic price. I don’t think you could make those dishes look any more appetizing… you’re making me hungry!